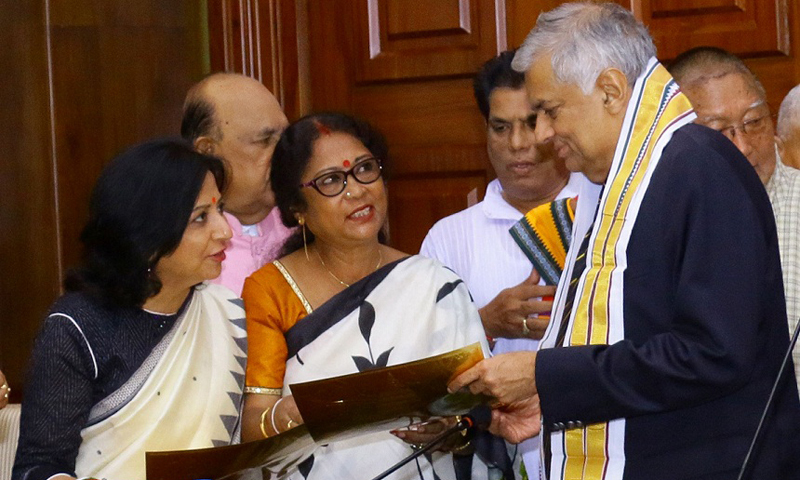 Prime Minister Ranil Wickremesinghe and Buddha Sasana Minister Gamini Jayawickrama Perera met with members of the Mahabodhi Society including Society President and Bhutan's former Speaker, Dasho Passang Dorji yesterday. The Prime Minister said their meeting was auspiciously timed falling just a few days after Poson Poya and praised the Society for forming a vital link between India and Sri Lanka through Buddhism. "You have come to Sri Lanka to see how Buddhism has flourished here," Prime Minister Wickremesinghe said. "The Mahabodhi Society has played an important role, both here and around the world." The Premier, addressing members of the society who were visiting from India and Bhutan, affirmed the importance of Sri Lanka's links with Mahabodhi, which was founded by Sri Lankan Buddhist leader, Anagarika Dharmapala in 1891 in an effort to revive Buddhism in India. Since then, the Society has opened offices around the world. He expressed hope that the life and services by The Blessed One will continue to live on in a strong relationship between Sri Lanka and India in the future. The event was followed by a reception where members of the society were able to meet the Prime Minister and Minister of Buddha Sasana.